Birds are warm-blooded vertebrate (having a backbone) animals whose bodies are covered with feathers and whose forelimbs are modified into wings. Most can fly. Birds are in the class Aves, which contains over 9,500 species divided among 31 living orders. One order, the Passeriformes or perching birds, accounts for more than one-half of all living species of birds. Most scientists believe that birds evolved from saurischian dinosaurs about 145 million years ago. The first truly birdlike animal, they point out, was Archaeopteryx lithographica , which lived during the Jurassic period. Fossils from this animal were found in Germany in the nineteenth century. This 3-foot (1-meter) long animal is considered to be an evolutionary link between the birds and the dinosaurs. It had teeth and other dinosaurian characteristics, but it also had a feathered body and could fly. A fossil discovery by scientists in 2000, however, threw into doubt the theory of birds' evolution. The fossils in question were excavated in 1969 in Kyrgyzstan, a former Soviet republic, but were not correctly identified until some thirty years later. The animal, Longisquama insignis , lived in Central Asia 220 million years ago, not long after the time of the first dinosaurs. From impressions left in stone, it had four legs and what appeared to be feathers on its body. Scientists who analyzed the fossils said the animal had a wishbone virtually identical to Archaeopteryx and similar to modern birds. It was a small reptile that probably glided among the trees 75 million years before the earliest known bird. Some scientists believe this challenges the widely held theory that birds evolved from dinosaurs. The bodies of birds are covered with specialized structures known as feathers that grow out of the skin. No other animal has them. Feathers act as a barrier against water and heat loss, are light but very strong, and provide a smooth, flat surface for pushing against the air during flight. The feathers of most species have color, often bright and beautifully patterned, that serves as camouflage and is used in courtship displays by males. The modified forelimbs, or wings, of birds are used for flying or gliding. The hind limbs are used for walking, perching, or swimming. Swimming birds typically have webbed feet that aid them in moving through water. The bones of the flying birds are structured for flight. They are very light and have many hollow regions. The wing bones are connected by strong muscles to the keeled, or ridged, breastbone, and the pelvic bones are fused so that they are rigid in flight. The jaws of birds are modified into a horny beak, or bill, that has no teeth and that is shaped according to the eating habits of each species. Like mammals, birds have a four-chambered heart that pumps blood to the lungs to receive oxygen and then to the body tissues to distribute that oxygen. Fertilization occurs internally, and the female lays hard-shelled eggs—usually in some type of nest—that have a distinct yolk. One or sometimes both parents sit on the eggs until they hatch, and the young of almost all species are cared for by both parents. Barb: The branches of a feather that grow out of the quill and are held together by barbules in flying birds. Barbules: Hooks that hold the barbs of a feather together in flying birds. Bill: The jaws of a bird and their horny covering. Feathers: Light outgrowths of the skin of birds that cover and protect the body, provide coloration, and aid in flight. Keel: The ridge on the breastbone of a flying bird to which the flying muscles are attached. Quill: The hollow central shaft of a feather from which the barbs grow. The keen eyesight and sensitive hearing of birds aid them in locating food. This is important because their high level of activity requires that they eat often. Birds are also very vocal, using various calls to warn of danger, defend their territory, and communicate with others of their species. Songbirds are any birds that sing musically. Usually, only the male of the species sings. The frequency and intensity of their song is greatest during the breeding season, when the male is establishing a territory and trying to attract a mate. 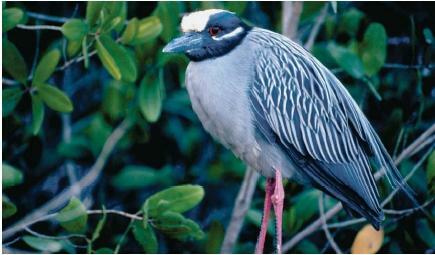 Birds are found the world over in many different habitats. They range in size from the smallest hummingbird, at less than 2 inches (6 centimeters), to the largest ostrich, which may reach a height of 8 feet (2.4 meters) and weigh as much as 400 pounds (182 kilograms). Many species of birds migrate hundreds or even thousands of miles south every autumn to feed in warmer climates, returning north in the spring. of chickens. The penguins of Antarctica are also flightless but are not regarded as ratites. Their powerful flight muscles are used for swimming instead of flying. Ratites are the oldest living birds and are descended from flying birds who lost the ability to fly. The feathers of ratites differ in structure from those of flying birds. They lack barbules—hooked structures that fasten the barbs of the quill together, providing an air-resistant surface during flight. Instead, the strands that grow from the quill separate softly, allowing air through. This softness makes the feathers of many ratites particularly desirable. Ostrich plumes, for example, have long been used as decoration on helmets and hats. Humans have destroyed birds, both intentionally and unintentionally. Two hundred years ago, birds were considered such an inexhaustible resource that wholesale slaughter of then hardly raised a concern. The greatest impact humans have had on birds has been brought about through human expansion (farms, cities, roads, buildings) into their natural habitats. A by-product of industrial development has been widespread environmental pollution. Pesticides, used on farms to rid fields of insects, have accumulated in many places frequented by birds and have been subsequently ingested by them. Oil spills have also taken their toll on bird populations. It is not surprising, then, that many species have disappeared as a result of human activities and encroachment on the natural environment. According to one scientific estimate, 85 species of birds, representing 27 families, have become extinct since 1600.